So despite our best efforts and extensive testing our first version had a couple of annoying bugs in it. We’ve just released a new version with these bugs corrected and suggest that anyone with a copy installed should upgrade to V1.0.1 for both Android and iOS. You can see what version you have by looking at the ‘About’ screen and scrolling to the bottom of the text. Thanks for you understanding and patience. 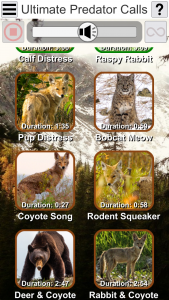 Ultimate Predator Calls is now available for download on the Google Play Store and the Apple App Store. The buttons on our home page will take you right there, or click the links above! Some screenshots from the iPhone version of the App below. We hope you like them. 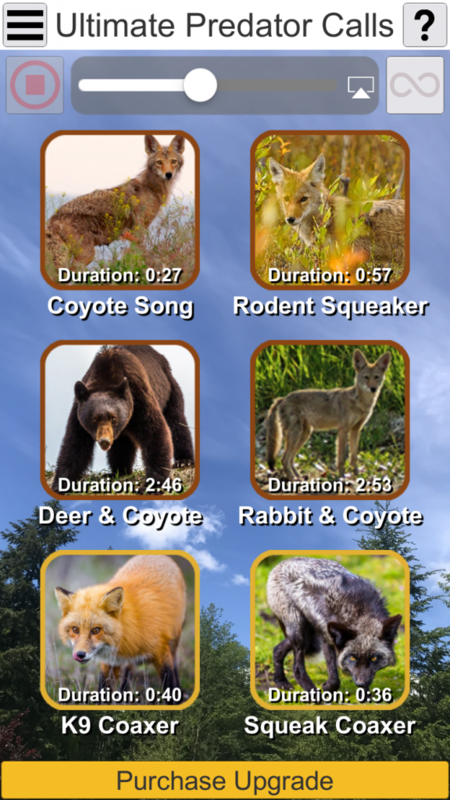 Thank you for visiting our site dedicated to the Ultimate Predator Calls app, available for iOS and Android. 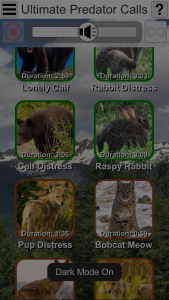 We think you will find it is the best predator call app on the market, not only in looks, but performance. These calls are not generic sound bytes like those found on other apps. 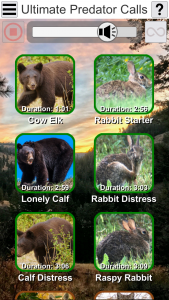 These quality sounds are custom made, hand recorded sets from predator hunting enthusiast and author Douglas Boze. Why these select sounds? They have worked for Douglas in Alaska, Idaho, Montana, Wyoming and Washington. We are pretty confident they will work for you too. A special thank you to all the predator hunters out there doing their part to help maintain healthy numbers of predators and ungulates alike. We thank each and every one of you for your support and would love to hear from you. It is our hope to update this app with more call sets down the road along with other surprises you are sure to enjoy, so be sure to check back often for any news and updates. Happy hunting to one and all!